Harken the call of Icarus with these intense, gilded Adidas JS Wings Gold sneakers. 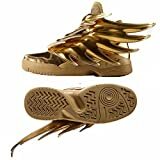 Brought to you by Jeremy Scott of the fashion house Moschino, the gold-winged kicks feature sweeping wings that flare out into individuated feathers. These shoes are so cutting edge they just might make you forget about your pining for self-lacing shoes and a real, flying hoverboard.